Every organization runs as a system with different important components. It is divided into departments which are run by employees performing different roles. Each work position is important and lays down the structure for a strong organizational setup. Companies, therefore, exhibit dependency for success on the efficiency of employees. Each worker must be proficient, skillful, diligent and motivated. Regularity is another one of the most significant qualities which make employees worthwhile. Showing up for work on time every day ensures that all work is being carried out smoothly. Frequent absence, on the other hand, can lead to a delay in projects and overall mismanagement. However, employees are entitled to occasional leaves on account of sickness or a personal emergency. There are also paid annual leaves to spend the time relaxing through a de-stressing vacation. A record of all these leaves is maintained by companies. Employees are not allowed to extend their leave period without a valid excuse. An employee attendance tracker ensures the regularity of each worker. This record carries considerable significance. Most importantly, it presents vital information for estimating each worker’s monthly salary. Deductions are made in case an employee takes extra leaves other than his or her paid leaves. This tracker also acts as a compelling force which drives employees towards regularity. Each individual is aware that his or her attendance is being recorded. In this way, they are prevented from taking undue advantages. They also need to maintain a good reputation by showing a perfect attendance record. Employees are often awarded certificates, bonuses or other prizes for a regular attendance. This is an important measure taken by companies for enhancing motivation. In addition, it also leads to improved employee retention over years. The employee attendance tracker may be maintained as a printed record. Alternatively, it can also be computerized. Backup copies should always be created to prevent the information from being lost or corrupted. Old records are important for creating annual evaluation reports about individual employees. 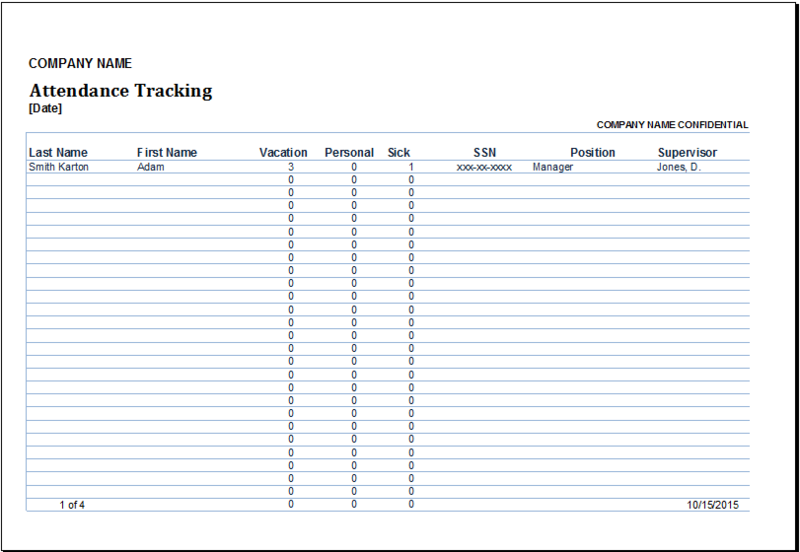 Online templates are available for creating a tracking document for employee attendance. These are simple to customize, download and use accordingly.